When we communicate, we often use more than a single language skill. On the telephone, for instance, we listen and speak-maybe we also write down a message and read over what we have written. Integrated approach helps to build new knowledge and skills on to what students already know and can do. So, if students are able to read a short story, this skill will help them to write their own story. Also, integrating the skills allows you to build in more variety into the lesson because the range of activities will be wider. 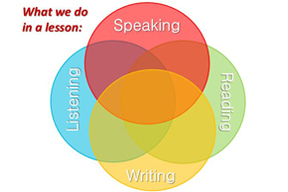 Instead of just having listening, the students can have speaking, reading and writing practice. This can raise their motivation to learn English. Above all, integrating the skills means that you are working at the level of realistic communication, which provides all-round development of communicative competence in English. 1) The easiest form of integration is within the same medium (either oral or written), from receptive to productive skills. 2) The second kind is complex integration. This involves constructing a series of activi­ties that use a variety of skills. However, it’s important to make sure that one activity is closely linked thematically to the next one. Integration of the four skills is concerned with realistic communi­cation. This means that we are teaching at the discourse level, not just at the level of sentences or individual words and phrases. Discourse is a whole unit of communica­tive text, either spoken or written. However, integrating the four language skills can be demanding of the teacher. We need to have a good understanding of discourse, and to be able to use textbooks flexibly. This can also be time-consuming, requiring a lot of preparation. Another limitation is the problem of designing suitable materials that take account of students’ different skill levels. The four skills tend to develop at a different pace: re­ceptive skills are stronger than productive skills, for example. This means that teachers have to be skilful is selecting or designing integrated activities for their students. Integrating the four language skills enhances the focus on realistic communication, which is essential in developing stu­dents’ competence in English. Two ways of integrating skills: simple integration, whereby a receptive language skill serves as a model for a productive language skill, and complex integration, which is a combination of activities involving different skills, linked thematically. Integrated language learning can be more motivating, because the students are using the language for a real purpose, in­stead of, say, just practising the grammar. Integration requires skilful teaching, but it can bring worthwhile results.